Your basic computer system specs are very important pieces of information to know when you plan to install new software or are asking the techs for help on ClearTechInfo. Every piece of software you purchase contains the “Minimum System Requirements” on the box or if you buy programs online you can find the information on the manufacturer website. [adblockingdetector id=”2″]The main 3 parts of information you must know are, What CPU, Operating System and How Much RAM does your computer have. If you are planning to install a game it is vital to know what video/graphics card your computer has. If anything goes wrong with your computer, in any situation we can help you here at the ClearTechInfo Computer Help Forum. But it is very important that you tell us what operating system, CPU and How much RAM you have. If you need help that relates to a game we also need to know what video/graphics card your computer is running. NOTE: The video tutorial below will work perfectly for Windows Vista (all versions) users. 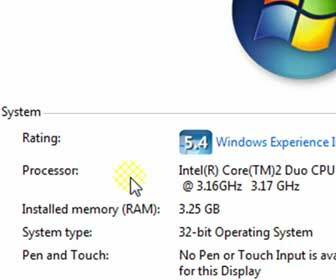 The method of finding your system specs has not changed between the two operating system versions.